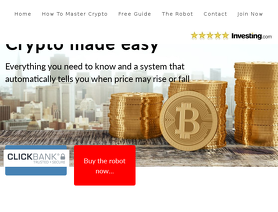 The 1000BitcoinTradingRobot is a Cryptocurrency trading robot. The 1000BitcoinTradingRobot.com can trade Bitcoin, Litecoin, Ethereum and Dash. Everything you need to know and a system that automatically tells you when price may rise or fall. Full Support: If you need any assistance, we will be happy to help. I have been impressed with this cryptobot. The signals are on point and the guide book helped me understand the basics of bitcoin and the other cryptocurrencies. I had to watch the installation video a couple of times but once it was loaded everything ran ran smoothly. As a newbie, I was ready to go through trial-and-error learning method but I am pleasantly surprised that the 1000-Bitcoin trading robot enabled me to start trading from the outset. I am more than satisfied with its efficiency and the signal system’s accuracy. For me it has been a worthwhile investment. It also helped me understand crypto-currency more as well as crypto-trading. GREAT SYSTEM FOR CRYPTO TRADERS!! This review is long overdue! So, after hearing so much about Cryptocurrency, I finally decided to invest in it using the Bitcoin Trading Robot. A guy called Jim runs the show and was an amazing mentor to me and the knowledge he had was impeccable. He never hesitated answering my questions and always replied to all my emails in a very short time. The cryptotrading robot he introduced to me was perfect for a newbie like me. It was very easy for me to understand the whole process. I got plenty of signals every week on different cryptocurrencies which was such an attraction for me to buy this software. I would recommend this system to all the beginners without any hesitation! !